Once upon a time, there lived a whale named Wally, who lived in the Atlantic Ocean. Wally was a very jolly whale and quite handsome. He was very popular in the Atlantic Ocean Kingdom for his kindness. He had lots of friends and was loved by every whale. Wally spent most of his days playing and swimming with his fellow whales. One day, Wally was swimming near the Pacific Ocean and heard a whale singing. Her voice was lovely and Wally couldn't resist not swimming over the border to get a glimpse of her. A few miles away, he found a pretty whale who was playing by herself. He knew immediately that he wanted to meet her. And so, Wally swam slowly towards her. When Wally was only a few meters away from the beautiful female whale, he introduced himself, "Hi, I'm Wally! You have a very nice voice. What's your name?" The female whale hesitated for a moment as she have never seen Wally in the Pacific Ocean Kingdom. But Wally was charming and she didn't feel afraid of him. And so, she replied, "Hi, I'm Wendy! I haven't seen you around here. Where are you from?" Wally explained how he heard Wendy's voice near the border of the Atlantic Ocean and just had to cross over to meet her. That was the start of a beautiful friendship. Soon after, Wally would always visit Wendy as often as he can and swim with her. They would talk for hours. They even have a favorite restaurant in the Pacific Ocean, where they would spend most of their time together. Wally and Wendy at their favorite restaurant! Eventually, their friendship grew to something more deeper. Wally knew he was falling for Wendy. And she felt the same way. But living in different oceans became a problem. It was not actually a forbidden love. But Wally knew that in order for them to be together, he would need to make a sacrifice to transfer to Pacific Ocean. This would entail leaving his family and friends whom he loves so much. Will Wally leave Atlantic Ocean to be with Wendy? Little did Wally know that Wendy was thinking of moving to Atlantic Ocean to be with Wally. One fine day, Wally said goodbye to his family and friends at Atlantic Ocean and swam to Pacific Ocean to tell her the good news that he loves her and will be moving to her ocean to be with her everyday. But when Wally got to Pacific Ocean, he couldn't find Wendy. He asked every whale he could find if they saw Wendy. Finally, a friend of Wendy told Wally that she went to Atlantic Ocean to be with him! Wendy went to Atlantic Ocean to be with Wally. Wally went to Pacific Ocean to be with Wendy. After hearing the news, Wally swam back to Atlantic Ocean as fast as his fins can take him. He found Wendy with his family and he was very happy. He approached her and said, "I love you, Wendy. I want to be with you forever." Wendy was delighted as she replied, "I love you too, Wally. Wally and Wendy loved their family and friends so much that they thought they didn't have to leave them permanently to stay together. They decided that half of the year, they would live in Atlantic Ocean and the other half, they would stay in Pacific Ocean. This made both of their families and friends really happy. And so, Wally and Wendy finally found a way to share their love without being oceans apart and they lived happily ever after. 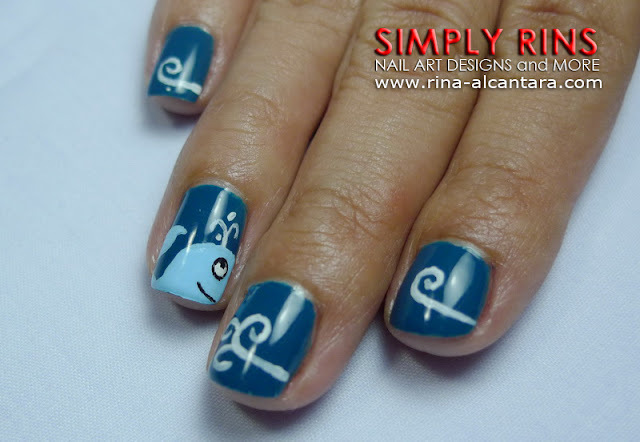 Thanks to my partner who suggested that I make a female and male version of the whale for this nail art design. This is similar to my Penguin Nail Art Design that had a girl and guy version as well. Thanks also to Color Club Gossip Column for being a nice base color for this whale nail design. I used 2 coats. This is actually my only Color Club nail polish. I would love to have more but sadly, they are very hard to find here in the Philippines. Lastly, thank you to all my readers who tolerated the love story! ;) I promise to share a nail art tutorial for this one on a separate post. Aaaw, what a sweet love story! And I love the nail art :) So cute! cute love story, great nails. So cute, I love the story! And the manicure is amazing. what do you do with your thumbs?